I have had this problem for a long time I assume. Only, I have only noticed it as a problem until recently. Making decisions- That includes, when buying things, agreeing, disagreeing, career choices. Things of these sorts. Maybe for a month and a half I will decide I want to be a physicist, I WANT to study physics. I will buy every book out there and pretend im some sort of scientist or something. I will tell people thats what I want to be. I feel 200% positive its what I want. Then......all of a sudden, one day I wont understand why in the world I would ever want to be that, it seems completely alien to me, and just ABSURD. Then all of a sudden, months later maybe I will want it again so im afraid to compeltely get rid of the idea. I have done this so far with. The problem is that when I decide these things, they feel like I really want them 200%. I even called this Rabbi and told him to convert me and all, and he started the process too, I even learned how to read hebrew. But now I feel like Why the hell did I want to do that?, I feel like I dont even remember who I was when I called that Rabbi, or what I was thinking. I have done this with all the above...When I wanted to be a doctor, I even enrolled in a hospital program, when I wanted to be a concert pianist, I applied to some conservatories. On the conversion to judaism thing...its a serious problem because now these people think I want to convert..because apparently I convinced him 100% when I gave him my speech on why I wanted to be jewish. Then I changed my mind....but then one day I woke up and wanted to convert again ...and I even wrote this e-mail assuring him how serious I was about it. And now, I dont understand WHY I EVER WROTE IT!. Im scared of telling him I dont want to convert because what if I change my mind again? When I change its like...these things seem SO important to me..its so bizzare! I mean, when I wanted them , I wanted them......but its not simply a change of mind..its complete disorientation...like "Why did I even do that?" later I dont understand why in the world I ever bought them. some reason Im not at some point....and then I realize what I have said and done, I regret it. I have been diagnosed with depression and anxiety disorders in the past...this is one area that I have been to embarassed to ask anyone. I hope you can help me, and that this wasnt too long! This is not an easy question to answer without meeting you. At the least, it could be a deep fear of commitment, or fear of failure, or fear of completing things - that could all relate to issues in your childhood. But another possibility is Bipolar Disorder. I don't have enough information to diagnose you - and only a complete evaluation could really clarify that diagnosis - but it seems like a possibility. Often during manic or "hypomanic" periods people are super motivated high achievers who take on all sorts of creative, ambitious new projects and feel unstoppable and highly motivated. But then when their mood shifts to depression, they have no confidence, no motivation, no pleasure or interest in the things they had been pursuing, and they give it all up. People get jobs while hypomanic and then quit or get fired when they're depressed. Some people even get married while hypomanic, and get divorced when they get depressed! So this is a real possibility. But other symptoms need to be present along with this in order to actually make that diagnosis. Difficulty making decisions is something that many of my Bipolar clients describe, especially during times that their mood is unstable, or when anxiety is present. People who turn out to have Bipolar Disorder often start out being diagnosed with depression and anxiety. So it would be well worth it to get a good professional evaluation. 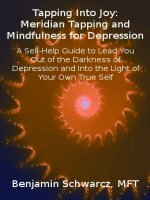 If these are purely psychological issues about fear of completing things, then Meridian Tapping/EFT could be very helpful to resolve it. And even with Bipolar, this can be a very useful tool for decreasing certain symptoms. Hope this helps. Please don't take this information as a diagnosis, but only a recommendation that you get evaluated.